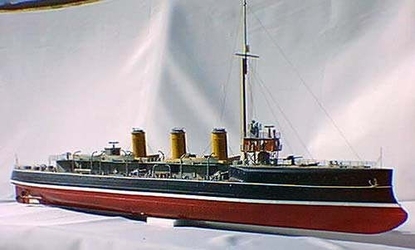 The Sentinel class of cruiser came from Vickers yard in 1905, had a ram bow, three funnels, and a turtle back fo/castle. The four, triple expansion engines developed 17,500 h .p. giving a speed of 25 knots. The ships of this class were small fast cruisers referred to as scouts. They arose from the need for a fast ship to perform a scouting role in the North Sea and keep an eye on the increasing activity by the German navy in that area. Coupled with this role was the requirement for a flotilla leader to the small seagoing destroyers. These ships had to have the ability to work with their brood, but to still provide for the captain and his staff. Whilst lightly armed, compared with a third class cruiser they had a high speed which enabled them to "scout" in the knowledge that they could outrun any serious opposition. A total of 15 scouts were completed between 1905 and 1913 all with differences in construction. 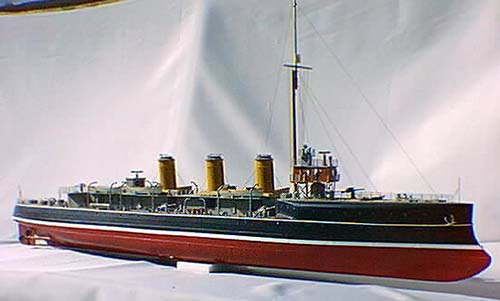 The plated fibreglass hull is the base for this model, along with the superstructure from computer printed 1mm plastic for the main assembly and a sheet of .5mm printed plastic adding the final sharpness to this elegant model. To add all the detail over 450 fittings cast in light alloy or plastic are included in the kit. Vacformed plastic mouldings take care of all the larger and more complex parts such as the many ships boats, funnels, vents and funnel bases. The many stanchions on this model are cast in light alloy to give the correct pattern of spacing, with 2 gauges of brass wire for the stanchion wires. Brass etched ladders add the finest detail and delicate touch to this model, one of the classics amongst warships. Although a large model by small ship standards the handling and sea-keeping qualities are outstanding. A comprehensive instruction book is included in the kit keyed to a FULL SIZE PLAN and large format exploded view. As in all the kits in the range, a full set of running gear is included in the kit. To add to the classic look of the ships of this era 2 colour schemes are included in the instructions. The black hulled victorian livery gives a great presence and for an alternative scheme the colour of China station are included along with the standard Atlantic fleet grey. Tips are also in the instructions for the use of the modern ACRYLIC car spray paints that are giving such outstanding results.